As a Coloradan, you are used to seeing a wide range of weather patterns. From unrelenting hot spells to frigid blizzards, your home or business resists a lot of damages through the course of a normal year. If your roof system has not held up as well over recent years, it may be time to look for professional roof replacement in Colorado. Schroeder Roofing is proud to be your source for the best roof repair and replacement services in the industry. Since 1977, our team of top-trained Colorado roofing contractors has worked to deliver the highest level of service possible. Our experience and dedication to quality allows us to deliver cost-effective solutions for buildings of all shapes and sizes. If you own a low-slope roof, you are probably aware of the logistical challenges of finding a material that can provide durable and comprehensive protection all year round. One material that has continued to make waves in the industry is ethylene propylene diene terpolymer (EPDM) roofing. 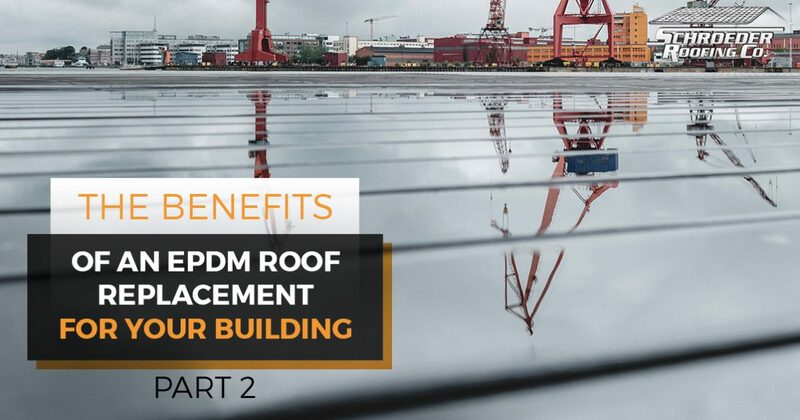 Today, we’ll continue to highlight the advantages that an EPDM roof can provide for your building. For decades, this product has proven its worth for commercial and appropriate residential applications. When you are finished, be sure to reach out to our professional roofers for a fast and accurate quote! In most home improvement projects, the budget normally has the final say. Property owners with low pitches will notice that it can be hard to find a roofing material that is both effective and affordable. Rubber roofs are known to be cost-effective, and there are a few reasons why. For one, the lightweight and practical roof installation process makes EPDM easier to install, saving you on labor costs. The synthetic makeup of this rubber material also provides a lot of bang for your buck, as EPDM roofing is one of the cheapest materials to install by the foot. Hiring a roof replacement company to install a new system is often one of the biggest investments you can make for your Colorado home, and it’s important to find a new material that can provide superior protection while not breaking your bank. Roofs that require repairs can present a serious problem for any homeowner. If your traditional roof material begins to leak or otherwise fail at its job, it can be very stressful trying to determine the full scope and depth of the damages. Ordering roof repairs can be complicated and costly, costing you in labor and materials. On the other hand, EPDM roofing is very durable and simple to repair. Roofing contractors can offer fast and inexpensive repair services, often consisting of speciality tape or liquid rubber to implement long-term repairs. EPDM roof installations, when done by professionals, rely on minimal seams and gaps. What this means for your roof is a lower chance of problems developing and a higher level of coverage to keep the elements out. Commercial and residential roofing comprised of EPDM components is better able to seal in the heat and retain your building’s temperature. This airtight bond can be helpful for sealing out drafts and moisture, keeping your energy bill low through every season. EPDM is built to insulate while also reflecting outside heat away, providing an additional bonus when the temperatures begin to soar. Rubber roofs are very eco-friendly, from fabrication to deconstruction. EPDM materials are easier to fabricate, requiring less energy to produce. Your rubber roofing is likely full of recycled materials, as modern advances have helped to make synthetic materials more eco-friendly than ever before. When your EPDM roof finally needs to be replaced (well-kept roofs last half a century or more! ), you can rest easy in knowing that your components are fully recyclable and won’t reside in a landfill. Here at Schroeder Roofing, we are dedicated to providing the best outcome for every client we assist. If you are interested in a new roof, it can pay to research different options before investing to ensure that you are left with the most effective and affordable system for your unique needs. Our experienced team has seen it all, and we offer comprehensive repair services and roof replacements in Fort Collins and beyond. If you’re looking for a roofing contractor with a proven history of providing quality results, contact us today for assistance!